This wholesome production from producer/director Robert Wise (of the previously popular West Side Story (1961) for which he won the same two Oscars) and 20th Century Fox has become one of the most favorite, beloved films of moviegoers. It is a joyous, uplifting, three-hour adaptation of Richard Rodgers and Oscar Hammerstein II's 1959 hit Broadway stage musical (that starred Mary Martin). [Note: This was the well-known partnership's last collaboration]. The story follows a good-natured, flighty novitiate (Andrews) who is hired to care for the seven children of a militaristic, icy, widowed Austrian captain (Plummer). She ultimately wins the heart of the children - and the captain, but their lives are threatened by the encroachment of Nazis. Marketing slogans cried: "The Happiest Sound in All the World." Ernest Lehman's screenplay was based on the book by Howard Lindsay and Russel Crouse. That book was in turn based on Baroness Maria von Trapp's 1949 autobiography (The von Trapp Family Singers) about the exploits of the family of singers and their escape from the Nazis in Austria in 1938. The first film version was a German film titled Die Trapp-Familie (1956), with a sequel Die Trapp-Familie in Amerika (1958). After the 1965 film's enormous success, Fox Studios unwisely invested millions in three more, less profitable, blockbuster musicals in the late 60s - Dr. Doolittle (1967), Star! (1968), and Hello, Dolly! (1969). The star of the film was the previous year's Best Actress Academy Award winner, a fresh-faced Julie Andrews in a similar role as her governess performance in Mary Poppins (1964). She is accompanied by her lovely singing voice, glorious, on-location travelogue views of Salzburg, Austria filmed in 70 mm, and melodic, memorable sing-along tunes, including "Maria," "The Sound of Music," "My Favorite Things," "You Are Sixteen, Going On Seventeen," "Climb Ev'ry Mountain," "Do-Re-Mi," and "Edelweiss." 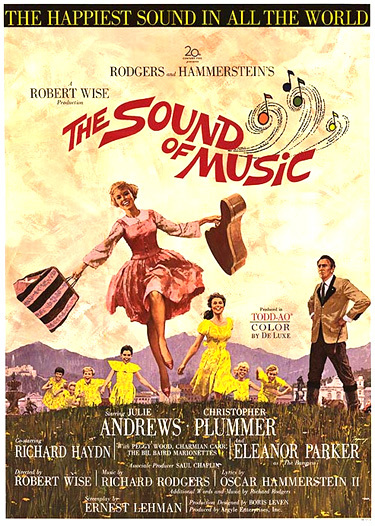 The sentimental, entertaining musical was nominated for ten Academy Awards, and came away with five major wins: Best Picture and Best Director (Robert Wise), Best Sound, Best Score (Irwin Kostal), and Best Film Editing (William Reynolds). Its other five nominations were for Best Actress (Julie Andrews who lost to Julie Christie in Darling), Best Supporting Actress (Peggy Wood), Best Color Cinematography (Ted McCord), Best Color Art Direction/Set Decoration, and Best Color Costume Design. To sing through the night like a lark who is learning to pray. Salzburg, Austria, in the last Golden Days of the Thirties. In Maria's nunnery, the nuns walk to chapel, chanting "Dixit Dominus." Prayers have been said in the chapel, but Maria is nowhere to be found, according to Sister Bernice (Evadne Baker): "I have looked everywhere, in all the usual places." Sister Margaretta (Anna Lee) defends Maria: "After all, the wool of a black sheep is just as warm." Sister Berthe (Portia Nelson), the Mistress of Novices, is uncertain of the future of the independent-minded, spirited nun-in training: "We are not talking about sheep, black or white, Sister Margaretta. Of all the candidates for the novitiate, I would say Maria is the least likely." Maria is always late for chapel: "She's always late for everything except for every meal." their overall assessment of Maria: "Maria's not an asset to the Abbey." How do you solve a problem like Maria? How do you catch a cloud and pin it down?...Many a thing you know you'd like to tell her, many a thing she ought to understand...How do you hold a moonbeam in your hand? In the Reverend Mother's chambers, the tardy Maria apologizes profusely for being distracted by the majestic scenery, and she begs for forgiveness: "I just couldn't help myself. The gates were open and the hills were beckoning...I can't seem to stop singing wherever I am." In the hopes that Maria's vocational goals are better suited elsewhere, the Mother Superior suggests that she leave the nunnery before she decides whether to become a monastic, cloistered nun: "It seems to be the will of God that you leave us...only for a while, Maria...Perhaps if you go out into the world for a time, knowing what we expect of you, you will have a chance to find out if you can expect it of yourself." The seven mischievous, incorrigible children test her and play a prank upon her, as they have done previously to run off other governesses. When she's not looking, they place a frog in her pocket. At the dinner table that evening in the formal dining room, Maria is again victimized by another of the childrens' antics - she sits on a rough-edged pine cone placed on her chair. She makes the children feel guilty for their practical jokes: "Knowing how nervous I must have been - a stranger in a new household, knowing how important it was for me to feel accepted, it was so kind and thoughtful of you to make my first moments here so warm and happy and pleasant." At the conclusion of their duet, they finally kiss just once. In reaction, Rolf races rapturously from the gazebo, while Liesl exclaims triumphantly with her arms outstretched: "Whee!" The von Trapp children don't play. They march. According to her, since the Captain's wife died, he is aloof and cold and "runs this house as if he were on one of his ships again - whistles, orders, no more music, no more laughing. Nothing that reminds him of her, even the children." However, the last time he visited the Baroness, he remained in Vienna for a month and "the Captain is thinking very seriously of marrying the woman before the summer's over." After the Captain has left, she conceives the idea of making playclothes for the children from the cast-off material of the soon-to-be replaced drapes, and resumes joyously singing "My Favorite Things." In the next scene, after the Captain has left for Vienna, Maria ignores his strict orders. She refuses to obey his harsh treatment of the family. Instead of keeping the children at home, she takes them on tours of the city and the surrounding countryside. The children accompany Maria to town, each wearing matching clothing from the heavy window drapes. They cross a footbridge and visit the open market for shopping, where she juggles ripe tomatoes. The happy group skips along the banks of a river, rides a train up into the Austrian Alps hills, where they experience an open-air picnic on the verdant grassy area of the film's opening sequence, with a magnificent panorama of beautiful peaks behind them. To prepare for the Baroness' arrival, she teaches them how to sing, beginning by giving a name to the fundamental notes of the scale - "Do-Re-Mi." When you know the notes to sing, you can sing most any thing. A quick-cut montage shows them walking, bicycling, riding in a carriage, and running. In the carriage sequence, each of the children take one of the seven notes on the scale - Maria points to them with the buggy whip, creating a melody with their voices: "Do, Mi, Mi, Mi, So, So, Re, Fa, Fa, La, Ti, Ti." On the steps of a garden area, she and the children jump up and down 'musical' steps - signifying higher and lower notes on the diatonic musical scale.